Who me? a Guest Designer for Scrapping for Less? 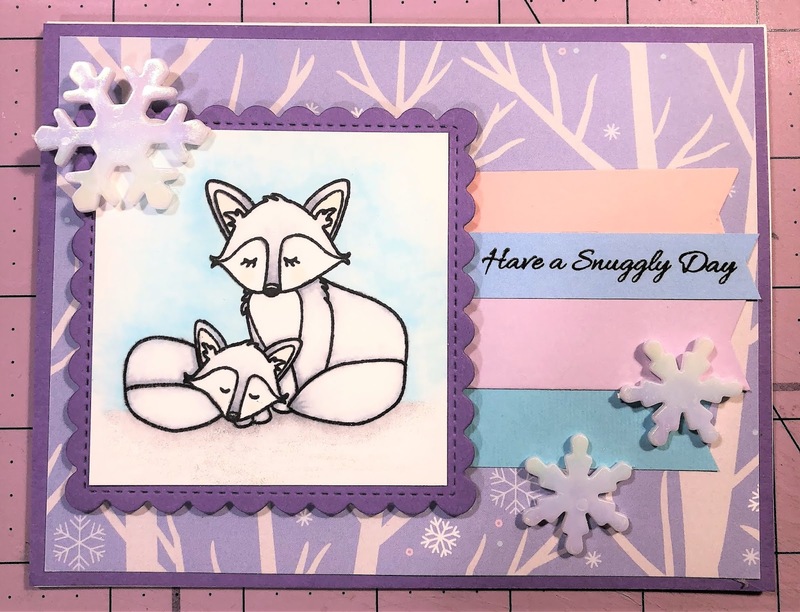 I have a video up on my YouTube channel today showing off the incredible December Flavor of the Month Card Kit, Animals of the Arctic! December’s kit is all about Arctic Animals…Now if you are anything like me, you hate the cold weather, snow, and anything that would mean being cold. However, snow and these cute little critters in this kit are all about fun! So grab your warm beverage, sit back, and hop along with us to see these adorable critters and all the inspiration our designers have to share. Check out the Flavor of the Month page to place your order if you haven’t subscribed. Also, don’t forget to check the A La Carte items (items that are leftover (full packs and such) from putting the kits together, and other items that we have on the website that may coordinate with this kit. Make sure you also put your name in for that Rafflecopter prize! So take a look at the cute cards I was able to come up with from this spectacular Kit! COLLECTION ONE: Winter Skies paper by Scrapping for Less, included the Bear Hugs stamps from Sunny Studios. I needed to do a "Night Sky" card for a swap I'm in, and this seemed like the perfect stamp to use! The night sky was blended with Eggplant Envy from Stampin' Up!, and flicked with some white acrylic paint. Then I used the tiny snowflakes from the stamp set with Versamark and Nuvo Glacier White Fine Embossing Powder. (This is the same combination I used for the sentiment strip.) I hand cut the snow bank, adding Glacier White Stickles along the edge and cut the circle with the same circle die as the background. I colored the Polar Bear with Copic Markers: E50 & E51, with B32 & B34 for the scarf. The trusty stitched rectangle die was used on some of this beautiful paper from Scrapping for Less. The base mat was the back side of one of the sheets from this collection--and to save paper, I cut the scalloped circle from the same piece! For finishing touches, I snagged the large snowflake by Jolee from Collection number 4, and added 3 of the Sequens by Buttons Galore. COLLECTION TWO: Included this FABULOUS Penguin with a Mug stamp from Stamping Bella and a paper collection called Chill from Scrapping for Less. I used the stippling method to make the scarf look all fuzzy! The purple card stocks were from the kit, but the teal card stocks came from me stash. COLLECTION THREE: Had these lovely papers and adorable little stamps from Pink and Main. The stamps were a little tough to color since they were so very small. Because of that, I chose to color these images with my Prisma Colored Pencils, with some Wink of Stella on the now caps, and under the animals. Of course this image took a good amount of masking to get all those little images together, too! The sentiment is actually from the Arctic Sentiments stamp from the Banana Split collection, and was stamped with Versafine, embossed with Nuvo Clear Fine Embossing Powder. I used the grey craft paper to cut the little snowflake--which cut very clean, BTW. Then topped the snowflake with Stickles. Loving the stitched rectangle die with this kit, LOL! 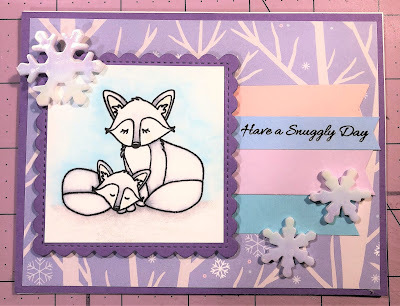 COLLECTION FOUR: Is from LDRS with Artic Snowfall papers, and Arctic Animals stamp set. I am loving these adorable critters--especially these foxes! The snowflakes are from the the garland--I just cut them apart. I still wanted to use the Moose from the Arctic Sentiments stamp included in the Banana Split Collection, so I used some papers from my own stash to change up the colors a bit. I really like the simplicity of this card! Please be sure to visit my YouTube channel for the Unboxing and video of the cards, and follow the Blog Hop for Scrapping for Less. The next hop is over to Stacy at Craft-A-Holic Momma! Great job Sarah... Love your cards. Sarah, these are such sweet cards! Love your cards! The coloring is so pretty. Super cute! Thank you for joining us this month! What a great eye you have! I really like all these cards. Thank you for putting the copic colors you used, it always is so appreciated! Cute cards. Love the penguin! Just darling cards! Thank you for sharing!